Australia has the power to impose a national ban on plastic single-use shopping bags but the government will not do it, says Federal Environment Minister Peter Garrett. This is despite a total ban on plastic shopping bags being enforced in China from June 1 this year, and a growing wave of similar bans in the United States and Europe. Consumers in the People's Republic of China had been using about three billion plastic bags a day. Even countries around the developing world, including Bangladesh, Bhutan and Zanzibar, are moving to eliminate use of the filmy plastic shopping bag. Australians used nearly four billion of the flimsy lightweight shopping bags in 2005, a reduction from the nearly six billion consumed in 2002. 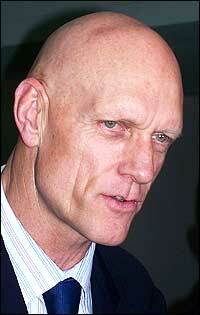 Australia's Environment Minister Peter Garrett. South Australia has opted to go it alone with a ban on use of single-use plastic bags from May next year. Garrett told the lunch audience that he had recently banned a residential development in north Queensland, which he said would have interfered with the local rainforest and the habitat of the endangered and protected flightless bird, the southern cassowary. "This is only the second time a proposal has been deemed 'clearly unacceptable' under the act and rejected outright," Garrett said. "The other was an application to shoot an unspecified number of threatened grey-headed flying foxes in New South Wales." He also announced that $2.25 billion Australian dollars had been allocated to the new "Caring for our Country" environmental fund, starting this month on July 1. Protests against shale oil developments wait for Minister Garrett. 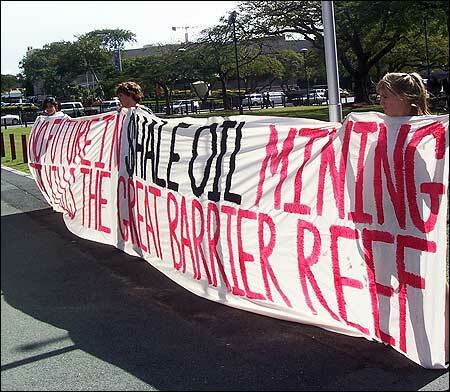 A group of environmentalists gathered outside the venue to protest against moves to develop a shale oil deposit near the Great Barrier Reef. Garrett refused to comment on the shale oil development.